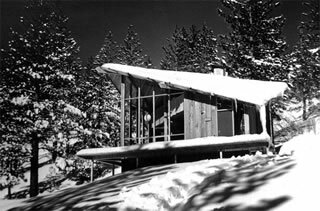 Henrik Bull's Klaussen cabin, Squaw Valley, 1954. 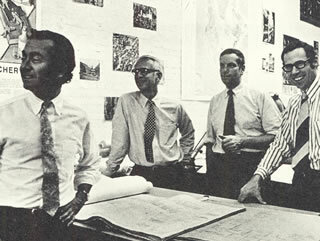 The San Francisco architectural firm of Bull Field Volkmann Stockwell, 1968, with Henrik Bull at far left. 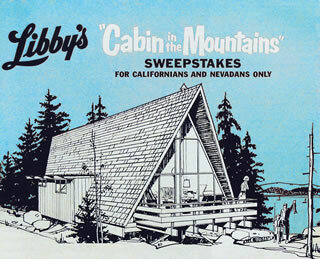 Ad by canned foods company Libby's from 1965 puts an A-frame up as its prize. “In some ways it’s really more conventional,” Bull says. “I had been a roommate of Klaussen before he decided to come west. He rejected my first design, which was pretty similar in plan, but then he said he wanted something more unusual. Around the same time, another Bay Area architect in the early years of his career was making his mark in Squaw Valley. George Rockrise moved to San Francisco from New York in 1947. Born to an English mother and Japanese father, he studied at Syracuse and Columbia universities, and then served as an architect in the Army Corps of Engineers during World War II. “He had trained as a pilot before the war, but because of his Japanese ancestry, they never let him fly,” Rockrise’s daughter Christina remembers. George Rockrise worked for the Army in Panama, then helped build the UN building in New York before heading to the Bay Area, where he worked with landscape architect Thomas Church before founding ROMA Design Group in the early 1950s. Rockrise’s plan for the Perlman house, which would grace the cover of Sunset magazine in 1957, started almost as informally as Henrik Bull’s Flender house. In fact, if not for some mosquitoes and a chance meeting, it might never have happened. David Perlman, a science writer for the San Francisco Chronicle, had signed a lease for a plot of U.S. Forest Service land near Lake Tahoe. The plan was to build a cabin designed by architect Joe Esherick. But that plan changed when the Perlmans visited their plot to take initial measurements. “We went up one day and started to stake out our property, and we got absolutely bitten alive by mosquitoes,” Perlman says. “By the end of the day, we decided we’re never going to do anything here.